So you want city AND beach? Not a problem in Cologne. There’s a whole raft of gorgeous places to bury your feet in the sand. 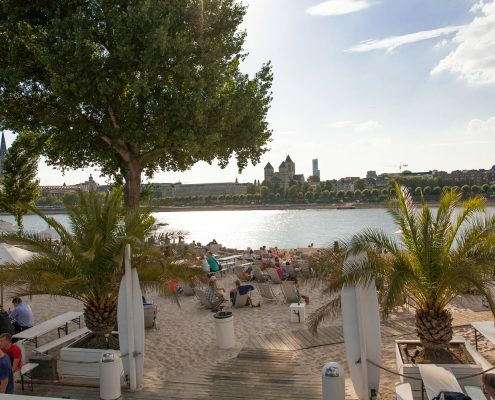 Here’s my top five tips for beach life right in the heart of the city, along the Rhine or at the lakeside. Check ahead for opening hours (weather depending) and whether there’s a private function. 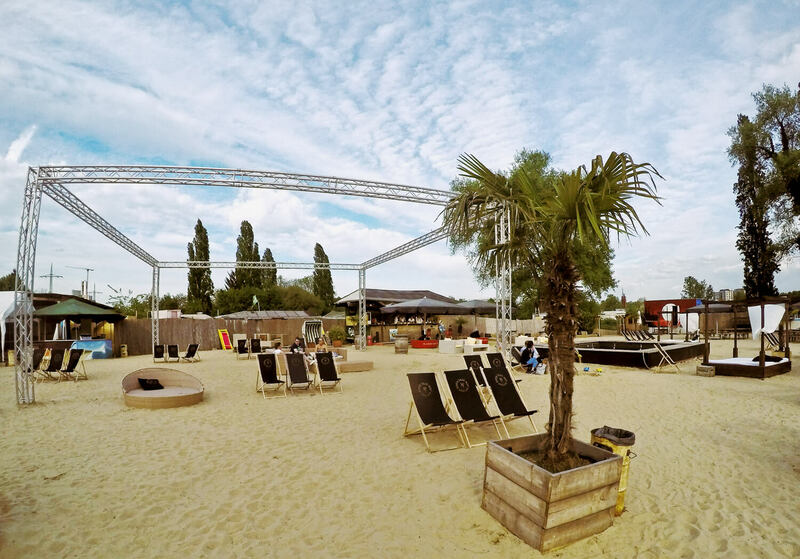 Deutz on the east bank of the Rhine is home to km 689 Cologne Beach Club and its fine white sandy floors. 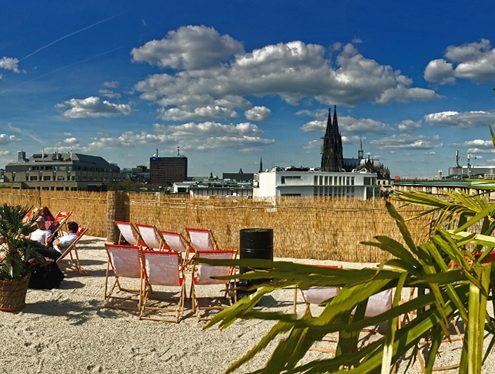 A little more business-like than its high-altitude counterpart, it offers unbeatable views of the Cologne skyline. 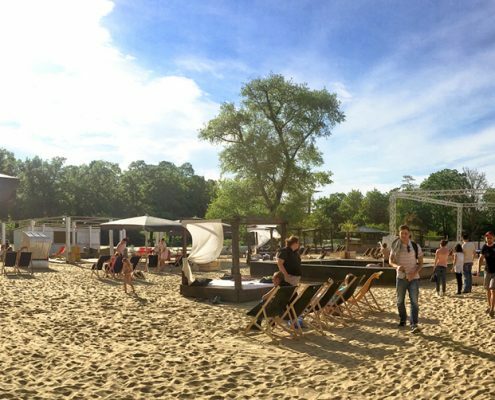 You sip your cocktail in comfy deckchairs or cosy canopy beds, gaze straight across to the Dom, watch the cargo boats float past and observe joggers and skaters on the riverside promenade. If you get peckish, head to the counter and order a salad, French fries or some Asian noodles. And if you get a little hot and bothered, there’s even showers to cool off. 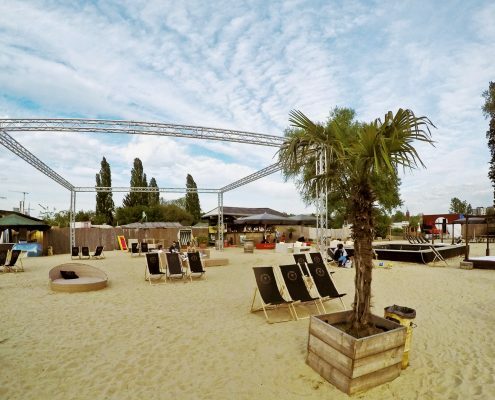 Round the back is Tanzbrunnen, a popular venue for outdoor events in summer. But km 689 also has its own venue, Klangklub, that stages musical events right on the premises. 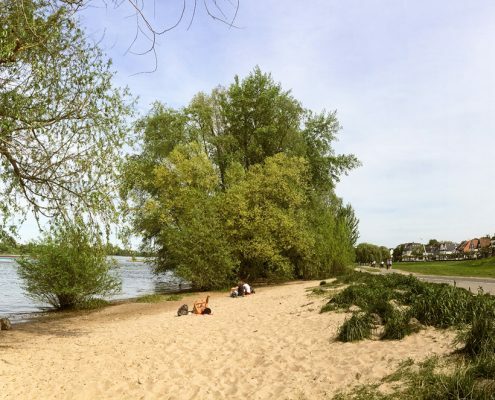 A couple of miles upriver is Poller Strandbar, a great place to end a walk along the Poller Wiesen floodplains with their flocks of grazing sheep and stunning views of the high-rise Kranhäuser and the Dom. 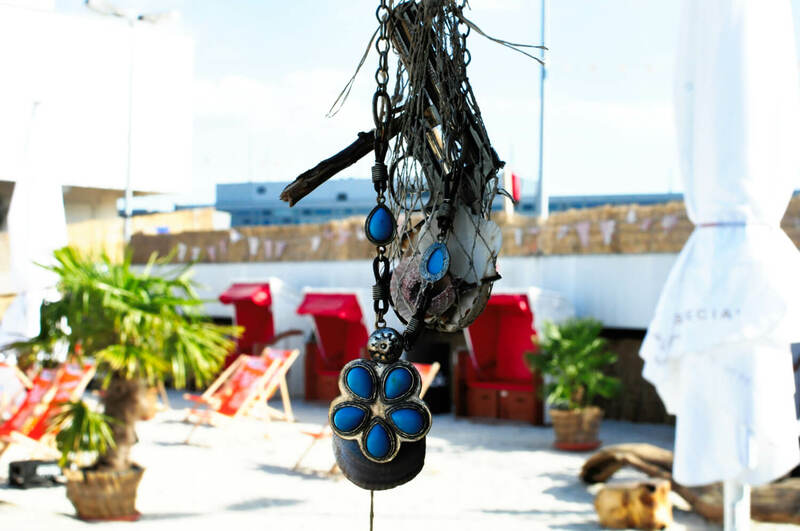 This large beach bar has a familiar atmosphere and is run by a close-knit and friendly team. Stylish loungers and deck chairs are arranged on two thousand tons of sand, surrounded by tall leafy trees. A small pool is perfect for cooling off hot feet, and there’s another splash pool specially for kids plus a small playground. For the big kids there’s a beach volleyball court and a table-tennis table. The outdoor kitchen serves pizza, salads and freshly barbecued burgers, while the bar offers the usual selection of drinks and, unusually, a wine list. Opening hours are weather-dependent; regular hours are noon to midnight. Blackfoot Beach at Fühlinger See is my go-to lakeside beach club when I’m feeling active and want to spend an entire day at the water’s edge. This place is home to Cologne’s only outdoor rope climbing circuit right on the water plus a diving school. You can do standup paddling, archery or canoeing and play beach volleyball. 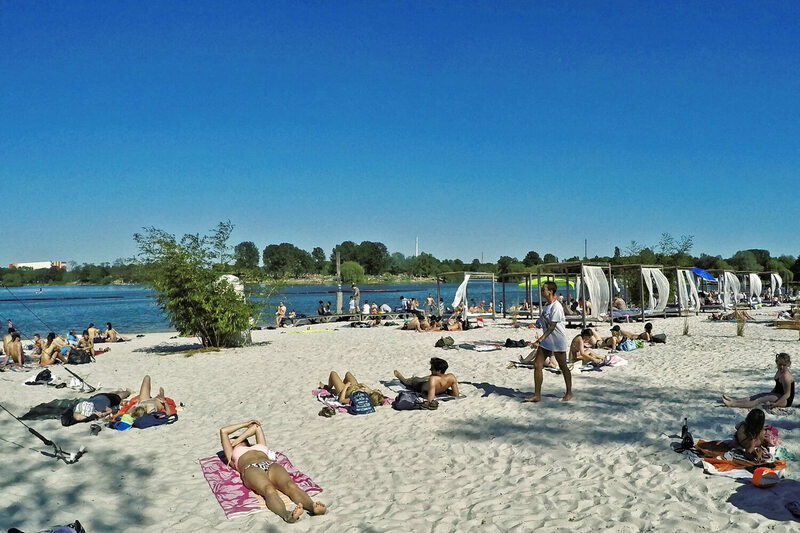 Fühlinger See, actually eight lakes including a sailing regatta course, is where Cologne heads for a one-day vacation. 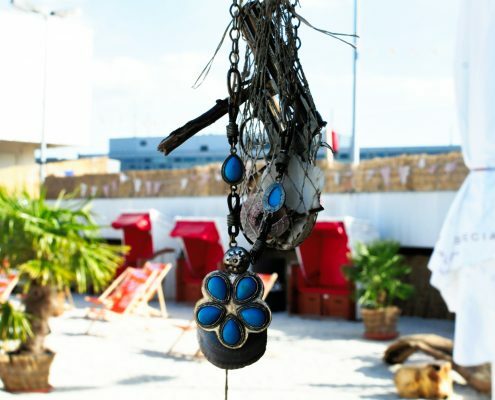 The beach bar has comfy daybeds, a white sandy beach and a varied food menu. Look out for themed parties like Salsa Night or Caribbean Night, accompanied with the right kind of music and food. From 1 May until 30 September, open everyday from 10 am to 8 pm. Adult day pass : EUR 4.80. Tenns’ and Kids’ admission is less. 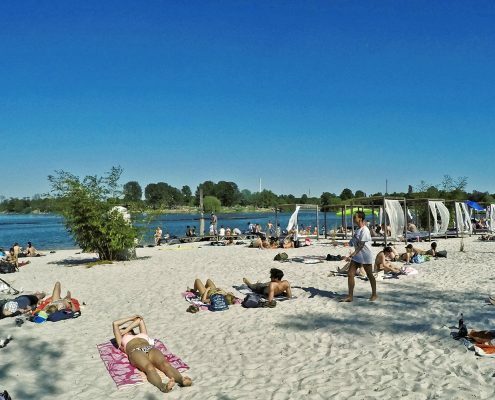 If you prefer to pack your own picnic basket and enjoy a beach without the club, head to the “kölsche Riviera” in the south of the city at km 683, the historic district of Rodenkirchen. There’s plenty of space here to spread out a blanket along one of the small bays at the riverside, take a stroll or stop off for a bite to eat at one of the floating restaurants or traditional inns at the water’s edge. The Weiße Flotte boats shuttle between Riviera and the city centre, offering stunning views of both sides of the Rhine, the bridges and the Dom. By the way, swimming in the river is not banned as such, but it’s very dangerous. 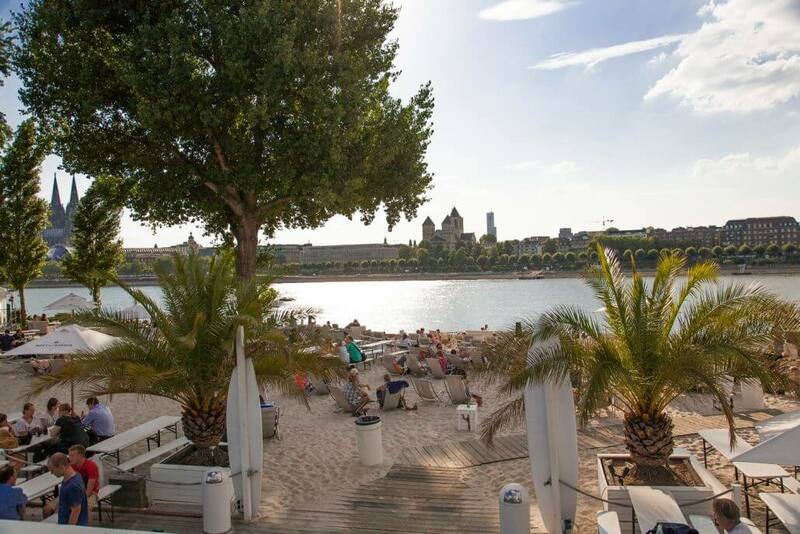 If you plan to test the waters, better head to the lake or one of Cologne’s open-air pools.